There’s an invisible line on the floor of the dungeon. It is a point of no return. Getting there will so exhaust the life and mana of your party that there is no chance of turning back and walking out alive. When you play this particular flavor of dungeon crawler, such as Etrian Odyssey or Persona 4, you can play conservatively and retreat well before things get hairy. Or you can burn cash and keep escape items on hand. Even then, there’s the question of when the rip cord is pulled. A practical crawler might cut and run once the work is done. The daring will hold out until every item is spent before hightailing it back home to cash out and lick wounds. There’s an invisible line on the floor of the dungeon. It is a point of no return. When I was a teenager, we used to play chicken on our bikes. In the late summer, when household stores of leftover fireworks were still brimming, we’d strap PVC pipe to the handlebars and fire bottle-rockets as we pedaled. Nobody ever lost an eye. Crashes were mostly unspectacular. It is hard to get up to speed when you’re trying to work a Bic. The real thrills came from the near misses – when a projectile would part your hair or explode close enough to feel the sting. Half the fun, though, was the buildup – the often hilarious juggling act of operating your bike and working your weaponry. There is something fun about working a machine, especially one that you’ve cobbled together on your own. That, for me, is the appeal of many contemporary board games like Race for the Galaxy or Agricola. Turn by turn you build a machine that generates a variety of resources. You bank these goods or use them to build better parts. And at some point towards the end of the game you shift gears and start cranking out victory points with your eyes on the prize. More and more, I look at my RPG parties as a custom built engine – a machine that I tweak, configure and run. My goal is to get as close to the invisible point of no return as possible without blundering past. I am playing chicken with certain death, but I am also doing something kind of unsexy. I am looking for efficiencies – ways to plow through the most monsters while burning the least resources. These two concerns seem far apart, but when you’re making decisions in turn-based slow motion, the immediacy of impending doom and the nickel-and-dime concerns of mana management blur together. In real-time these moments come and go in a breath. Playing BioShock Infinite on the “hard” difficulty I find that one false move, a headlong charge into the fray, can be punished quickly and with little opportunity for reversal. I don’t make many choices when I’m Booker DeWitt so much as channel impulses. I act and react. Sid Meier once called games “a series of interesting decisions.” The nice thing about turn-based games is that you can make these decisions deliberately – mull over each one as it comes. The trade-off, of course, is that sense of the the wind in your hair and the smell of gunpowder on your lips. Our theme this week is “play.” The childhood images I keep going back to as I write are tactile pretend. Every playground, nowadays, has a stainless steel steering wheel bolted to the jungle gym. And the first thing most kids do when they see the thing is to run up and give it a spin. Children waiting in cars gravitate towards the gear shift. Our first desire is to be allowed behind the wheel. But soon after, just being allowed to operate the machine is not enough. You want to push the thing to its limits. 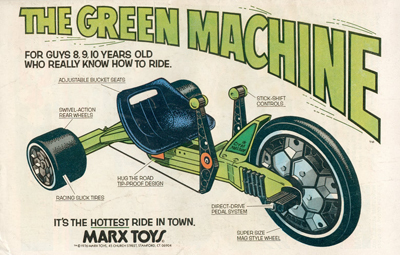 When I was six I was lucky enough to get a Green Machine for Christmas. The vehicle was like a recumbent Big Wheel with two giant hand brakes. If you got up to speed and jammed the brakes in opposite directions, you’d spin out in a wicked power slide. There’s an undeniable thrill in giving up those moments of control, but for me the real thrill came from having the controls in my hands and deciding the precise moment to let ‘er rip. Pretension +1 is a weekly column about the intersections of life, culture and videogames. Follow Gus Mastrapa on Twitter @Triphibian. All content is owned by Unwinnable and the fine folks who contribute to it, so just back up off it Mr. Sticky Fingers. Support videogame blogs with your clicks, quality publications with your bucks and always tip your bartender.